Tamer Sahin was born in 1981. Between the years of 1999-2001, when he was eighteen years old, Sahin was accused of hacking the systems of the Turkish bank “Osmanlı Bankası”, the Internet service provider “Superonline” and “Microsoft”. After the process, Tamer Sahin went down in history and literature as the first officially sentenced hacker of Turkey. This lawsuit is still being discussed at law faculties and in lessons at education institutes. Facing his responsibilities at the age of 22, Sahin invested time on the ethical hacker philosophy and focused on institutionalizing his business. He realized his first projects in cooperation with the Police Department, the Gendarmerie Intelligence Organization (JİT) and with Interpol. He acted as consultant in the field of national security in Turkey, as well in several cases related to information security issues that concern public security. 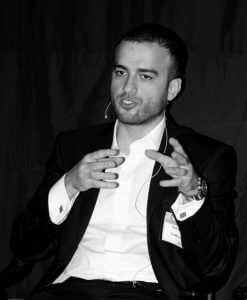 Tamer Sahin transformed his ethic hacking talents for leading organizations in the private sector and public institutions by detecting vulnerabilities in numerous computer systems. He developed a wide range of defense strategies against risks and weaknesses. Sahin is one of the developers of Turkey’s first indigenous software “Mindwall IDS” of information security. The software Mindwall Intrusion Detection software was invested by the United States and was established in global famous companies such as AT&T, Chase Manhattan Bank and Citibank. By working in cooperation with global famous companies like Microsoft, HP, AOL, Redhat and Novell, Tamer Sahin detected vulnerabilities in their softwares. Sahin enriched the world of the information security by publishing more than 50 security advisories that are registered under his name. In the year of 1999, he published the first vulnerability announcement. The national R&D product became a decisive base of the indigenous Cyber Intelligence. There is a number of national and global published media about Tamer Sahin. Coskun Aral (Turkish correspondent, photo/television journalist, documentary/film producer) created a documentary film about Sahin’s life. Tamer Sahin’s works and its social affects were considered and analyzed in several projects, documents and presentations at Istanbul Technical University, Isik University and at the American Collegiate Institute (ACI). Tamer Şahin’s person was referred in the Turkish action series like “Kurtlar Vadisi” (Eng: Valley of the Wolves) and “Deli Yürek” (Eng: Crazy Heart) as “Hacker Tamer”. Tamer Sahin has published several papers in the newspaper “Star” and in the journals “T3” and “Digital Age”. In order to transform his know-how to other people, Sahin performs speeches at universities and corporate firms. He published his experiences in his book “Hacker’ın Aklı” (Eng: Hacker’s Mind), which was published by “Doğan Kitap” at its third edition. The book has been added to the archive of the Parliamentary Library of Turkey and the National Library of Washington DC in the USA. Tamer Sahin prepares and offers solutions to leading companies in the sector under the roof of his also sector leading company TerraMedusa Secure, he is the founder of.